"Detecting damage with curvature from vehicle measurements"
On 10th July 2017, the paper titled “Damage Detection using Curvatures obtained from Vehicle Measurements” by Daniel Martinez (ESR12), his supervisor Eugene OBrien, and Abdollah Malekjafarian and Enrique Sevillano, came available in the website of Journal of Civil Structural Health Monitoring. The paper is open access and can be downloaded at the DOI link of the publisher’s website provided with the full reference below. This paper describes a new procedure for bridge damage identification through drive-by monitoring. Instantaneous curvature (IC) is presented as a means to determine a local loss of stiffness in a bridge through measurements collected from a passing instrumented vehicle. Moving reference curvature (MRC) is compared with IC as a damage detection tool. It is assumed that absolute displacements on the bridge can be measured by the vehicle. The bridge is represented by a finite element (FE) model. A Half-car model is used to represent the passing vehicle. Damage is represented as a local loss of stiffness in different parts of the bridge. 1% random noise and no noise environments are considered to evaluate the effectiveness of the method. A generic road surface profile is also assumed. Numerical simulations show that the local damage can be detected using IC if the deflection responses can be measured with sufficient accuracy. Damage quantification can be obtained from MRC. 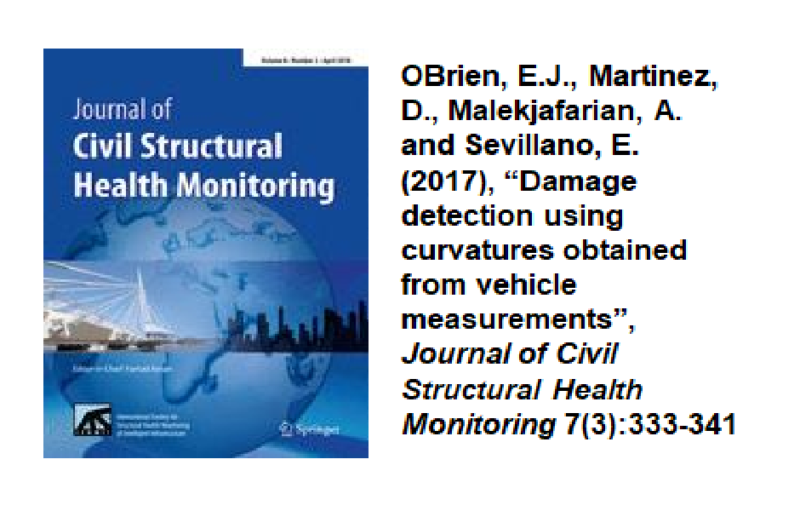 Keywords: Bridge; drive-by damage detection; structural health monitoring; SHM; instantaneous curvature; moving reference curvature.